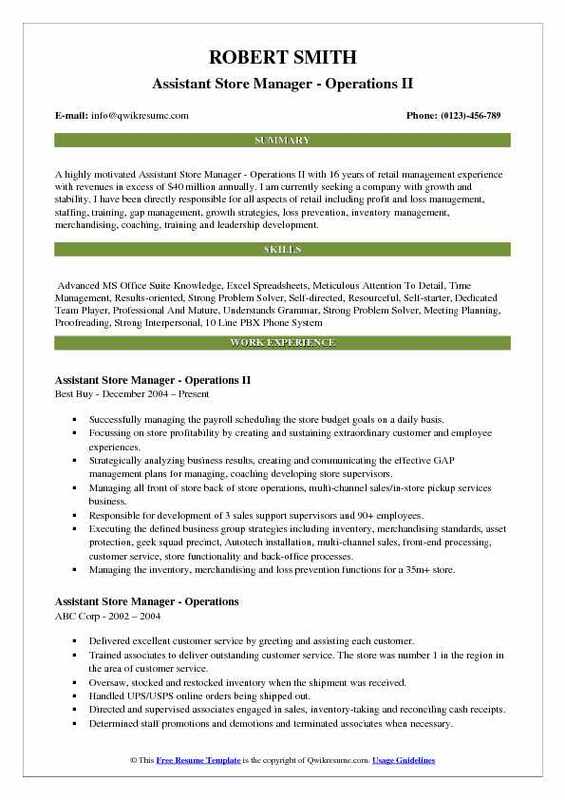 An Assistant Store Manager, Operations in association with the Assistant store manager will lead the merchandising team and set effectively the stage needed for store activities. The job description for these assistants listed in the Assistant Store Manager Operations Resume are generic and may vary upon functionality and job setting, the typical duties listed in the resume are – leading, directing and delegating product flow; ensure execution of strategies and plans, communicate all critical metrics; coaching, training and teaching all aspects of development and performance to store associates and build a strong bench of talent among the staff. Qualifications normally expected by the employers for this job post are commercial awareness, excellent communication skills, accuracy and attention to details. Highlighting qualities such as working knowledge of related software, delegation skills, and strong interpersonal skills will prove to be an asset. Candidates applying for this job role make a display of a high school diploma to the least. 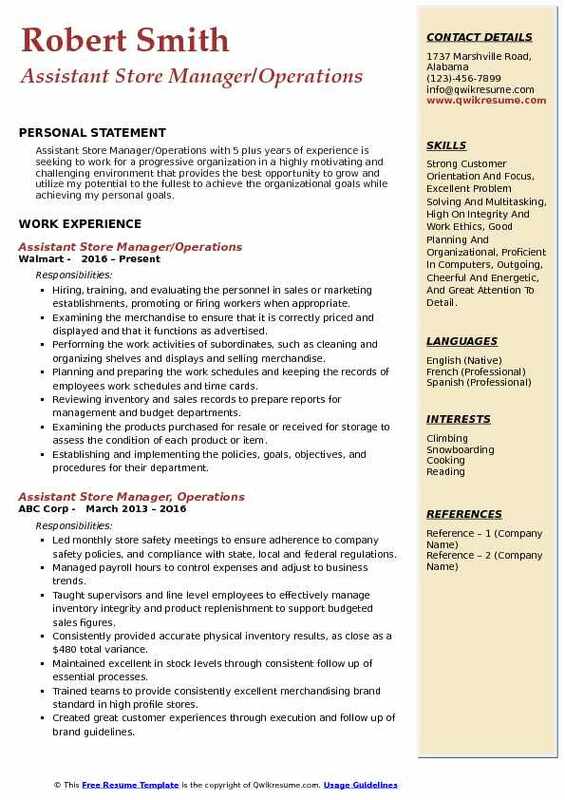 Objective : Assistant Store Manager - Operations with 4 plus years of experience in the Retail domain is seeking to obtain an administrative or management position that allows me to utilize my leadership and development abilities that I have acquired over the course of my years in the workforce. To gain more experience by Working with new team members as well as learning different company strategies for leadership development. 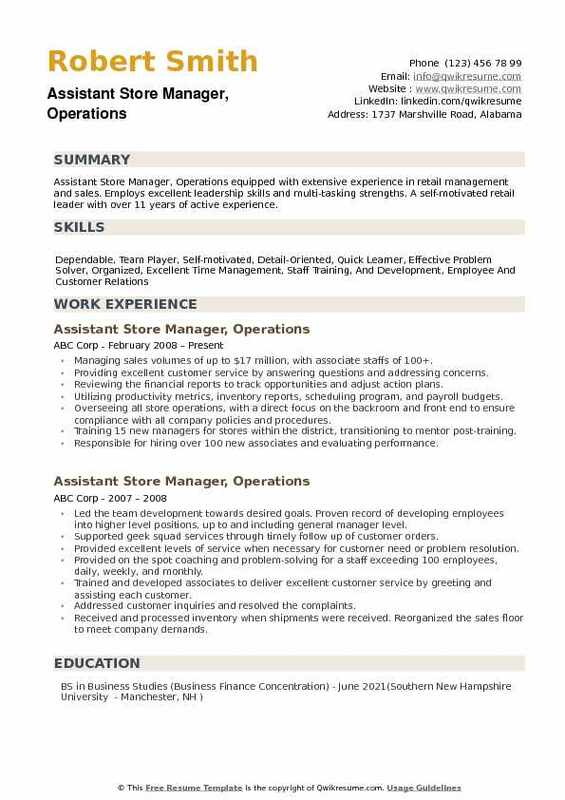 Responsible for assisting the Store Manager in the day-to-day operations of the store. Developing the associates for promotion and communicating the clear expectations to store leadership team and associates in order to achieve company objectives consistently. Maintaining personal knowledge of and embracing the corporate customer service, merchandising, and operating requirements. Supporting the Store Manager in creating a sales culture that increases sales, fosters and develops a consultative selling environment and improves customer service. Developing and cultivating a strong working relationship with key business partners and leverage all internal resources to achieve company, territory, district, and store objectives. Ensuring that the store operates in full compliance with applicable laws, regulations and company policies including but not limited to talent management processes, pre-employment screening process, and associate file maintenance and compliance. Performing the cash pulls and making the change orders and deposits in accordance with established policies. Summary : Assistant Store Manager - Operations with 9 years of experience in the Retail domain is seeking to obtain an operations position with an organization where my skills and experience can be effectively utilized to increase company profitability while maintaining compliance and execution. 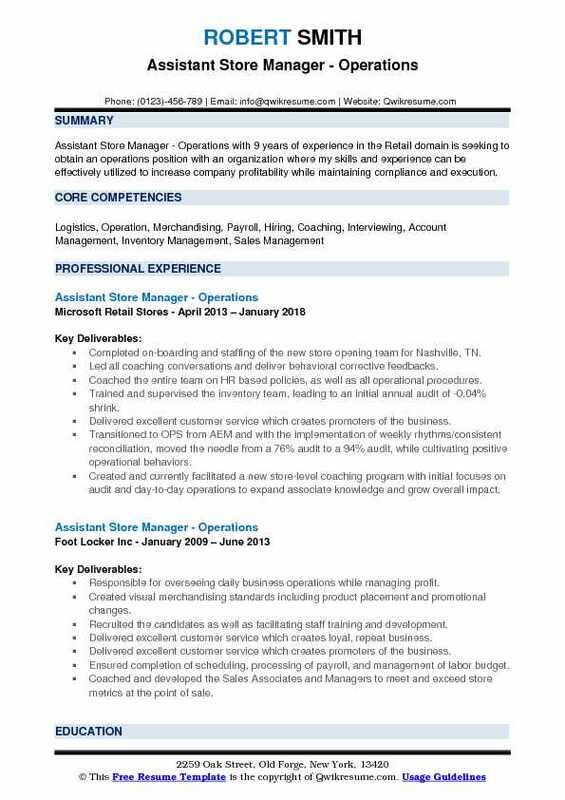 Completed on-boarding and staffing of the new store opening team for Nashville, TN. Led all coaching conversations and deliver behavioral corrective feedbacks. Coached the entire team on HR based policies, as well as all operational procedures. Trained and supervised the inventory team, leading to an initial annual audit of -0.04% shrink. Delivered excellent customer service which creates promoters of the business. Transitioned to OPS from AEM and with the implementation of weekly rhythms/consistent reconciliation, moved the needle from a 76% audit to a 94% audit, while cultivating positive operational behaviors. Created and currently facilitated a new store-level coaching program with initial focuses on audit and day-to-day operations to expand associate knowledge and grow overall impact. Maintained a positive floor presence driving engagement and experience. Summary : A highly motivated Assistant Store Manager - Operations II with 16 years of retail management experience with revenues in excess of $40 million annually. I am currently seeking a company with growth and stability. I have been directly responsible for all aspects of retail including profit and loss management, staffing, training, gap management, growth strategies, loss prevention, inventory management, merchandising, coaching, training and leadership development. Successfully managing the payroll scheduling the store budget goals on a daily basis. Focussing on store profitability by creating and sustaining extraordinary customer and employee experiences. Strategically analyzing business results, creating and communicating the effective GAP management plans for managing, coaching developing store supervisors. Managing all front of store back of store operations, multi-channel sales/in-store pickup services business. Responsible for development of 3 sales support supervisors and 90+ employees. Executing the defined business group strategies including inventory, merchandising standards, asset protection, geek squad precinct, Autotech installation, multi-channel sales, front-end processing, customer service, store functionality and back-office processes. Managing the inventory, merchandising and loss prevention functions for a 35m+ store. Managing to create a culture of safety, security profitability for all store employees. Facilitating, coaching and training out company initiatives through store meetings on a daily basis. Monthly, quarterly annual performance appraisals for all sales employees supervisors. Objective : Sales professional with more than 15 years of experience in managing and motivating teams to increase sales and ensure operational effectiveness in Big-Box retail. A self-motivated leader with strong organizational and prioritization abilities. Supervising the associates engaged in sales, inventory receipt, reconciling cash receipts, or in performing services for customers. Preparing the weekly schedules to ensure proper floor coverage within fiscal guidelines. Promoting the customer service by ensuring associates are greeting and assisting customers. Responding to the customer inquiries and complaints in a professional and timely manner. Performing the basic operations activities including cash handling and reporting, price changes, merchandise handling, and open and closing duties. Reviewing the time sheets and other payroll documentation for accuracy and submits as appropriate. Monitoring the associate sales activities and productivity, acknowledging and communicating the performance to associates, motivating and training the associates to achieve full potential. Maintaining an awareness of customers to both increase service levels and reduce security risks, remaining current on operational policies regarding payment and exchanges, and security practices. Maintaining the knowledge of current sales and promotions, presenting and displaying the merchandise in accordance with current promotions and standards. 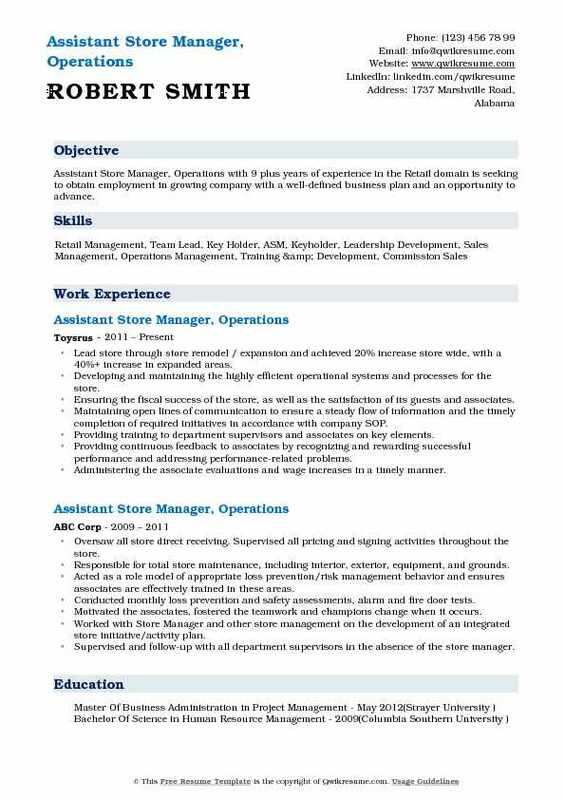 Summary : Dedicated and focused Assistant Store Manager - Operations I with 11 plus years of experience, who excels at prioritizing, completing multiple tasks simultaneously and following through to achieve goals. Seeking a role of increased responsibility. Planned, developed and executed a successful department improvement plan to achieve a 20% sales increase. Developed consistency in stores to support sales and company goals achieving a 95% execution rate. Ensured compliance with company policies and procedures by holding hourly associates accountable. Analyzed and interpreted reports, implemented and monitored asset protections and safety controls. Maintained the quality assurance standards, oversaw safety and operational reviews. Developed and implemented the action plans to cover deficiencies, and provided direction and guidance on executing new programs and strategic initiatives. Provided supervision and development opportunities to hourly associates by hiring, training, assigning duties, evaluating performance, providing recognition, and ensuring diversity awareness. Drove financial performance by ensuring that sales and profit goals are achieved and implemented plans to correct deficiencies. Summary : Assistant Store Manager, Operations with 9 plus years of experience in the Retail domain is seeking to obtain employment in growing company with a well-defined business plan and an opportunity to advance. Lead store through store remodel / expansion and achieved 20% increase store wide, with a 40%+ increase in expanded areas. Developing and maintaining the highly efficient operational systems and processes for the store. Ensuring the fiscal success of the store, as well as the satisfaction of its guests and associates. Maintaining open lines of communication to ensure a steady flow of information and the timely completion of required initiatives in accordance with company SOP. Providing training to department supervisors and associates on key elements. Providing continuous feedback to associates by recognizing and rewarding successful performance and addressing performance-related problems. Administering the associate evaluations and wage increases in a timely manner. Responsible for all accounting/cash accountability procedures and payroll functions. 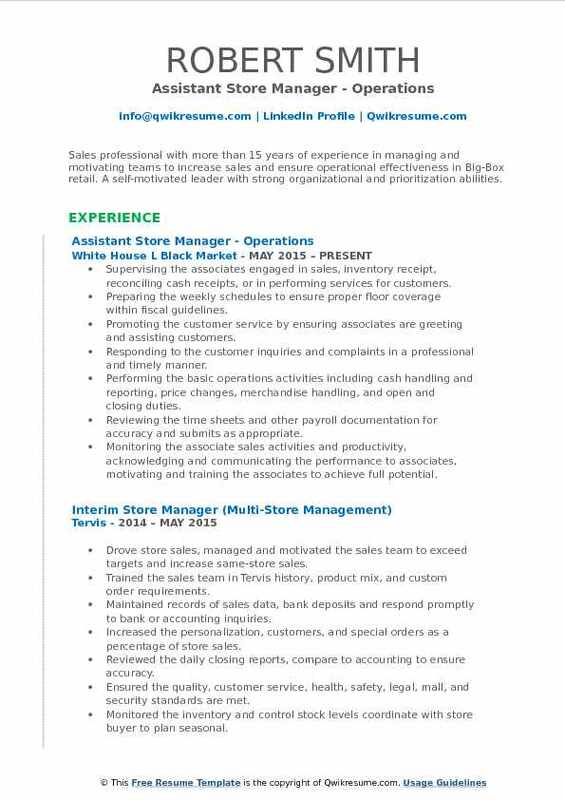 Summary : Assistant Store Manager, Operations with 7 plus years of experience in the Retail domain is currently looking for a full-time position with a company that offers a greater challenge, and the opportunity to help the company advance efficiently and productively. I am self-motivated and a problem solver with 6 years of leadership and managerial experience in a fast-paced environment. Partnering with the Store Manager and store Employees to lead and manage daily operations of a 12 million dollar annual sales volume retail store. Leading/directing 4 area supervisors, 5 department supervisors, and up to 108 associates to ensure daily duties are performed according to the company's best practices. Participating in the hiring process and administering the annual associate reviews. Review business summary and sales report weekly for sales opportunities. Leading and directing the price changes team to ensure compliance goal is accomplished. Participating in and leading the area supervisors and employees to meet daily sales and credit goals. Supervising the sales areas to ensure job execution in various departments according to the store directives. Driving the customer service scorecard results to ensure 85% compliance report weekly by leading sales floor associates to deliver great customer experience. Coaching the employees to ensure company's ethical standards and policies are being followed. Building and coaching the supervisors and other store employees to develop skills in other areas of responsibility. Leading and directing the store employees to process and merchandise freight according to the company's merchandising standards. 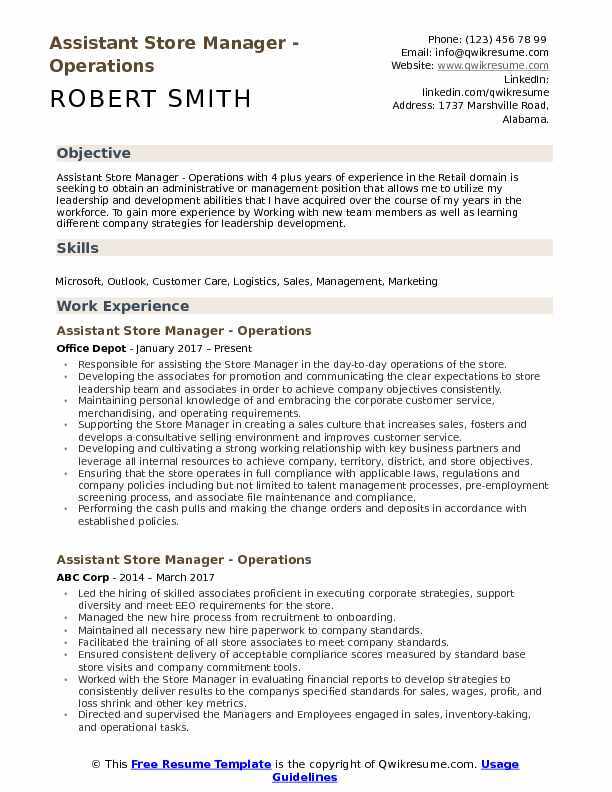 Objective : Assistant Store Manager Operations with 4 plus years of experience in the Retail domain is seeking to begin a career that utilizes my previous experience in customer service, hospitality, and leadership. Improving the operational systems, processes, and policies in support of organizations mission specifically, support better management reporting, information flow and management, business process and organizational planning. Overseeing the storewide merchandising benchmarks to maintain operational excellence. Validating the company presentation standards on displays for each department. Managing and increasing the effectiveness and efficiency of support services (HR, IT and Finance), through improvements to each. Functioning as well as coordination and communication between support and business functions. Play inga significant role in long-term planning, including an initiative geared toward operational excellence. Overseeing the management of finance, planning, systems, controls, and vendor accounts. Management of store budget in coordination with the district operations manager and general store manager. Development of individual department budgets based on forecast demand. Regular meetings with market operations manager around fiscal planning. 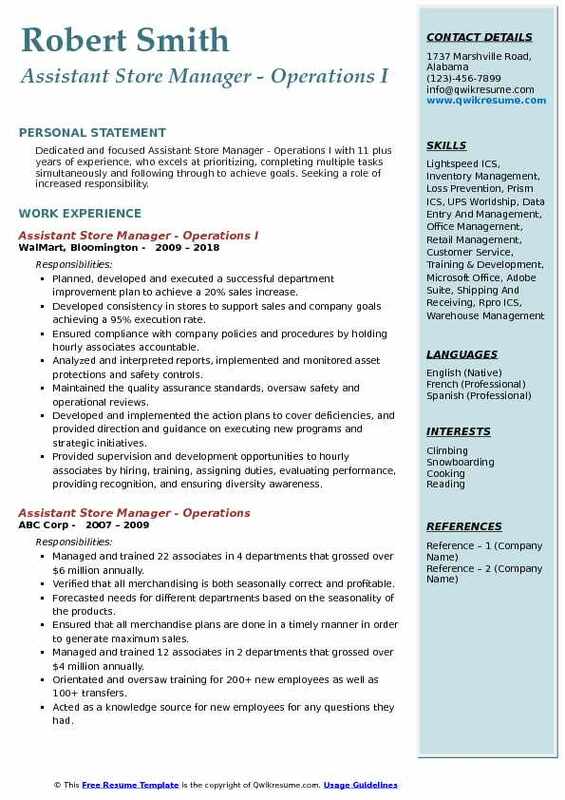 Headline : Assistant Store Manager/Operations with 5 plus years of experience is seeking to work for a progressive organization in a highly motivating and challenging environment that provides the best opportunity to grow and utilize my potential to the fullest to achieve the organizational goals while achieving my personal goals. Skills : Strong Customer Orientation And Focus, Excellent Problem Solving And Multitasking, High On Integrity And Work Ethics, Good Planning And Organizational, Proficient In Computers, Outgoing, Cheerful And Energetic, And Great Attention To Detail. Performing the work activities of subordinates, such as cleaning and organizing shelves and displays and selling merchandise. Planning and preparing the work schedules and keeping the records of employees work schedules and time cards. Reviewing inventory and sales records to prepare reports for management and budget departments. Examining the products purchased for resale or received for storage to assess the condition of each product or item. Establishing and implementing the policies, goals, objectives, and procedures for their department. Conferring with company officials to develop methods and procedures to increase sales, expand markets, and promote business. Developing solicitations and evaluate responses. Compiling complete bidders list from qualified applications, knowledge of suppliers, contacts with trade associations, small business administration, or other sources. Preparing and issuing solicitation documents selecting appropriate clauses, ensuring clear and complete specifications, including packing and delivery requirements or other routine supplemental stipulation. 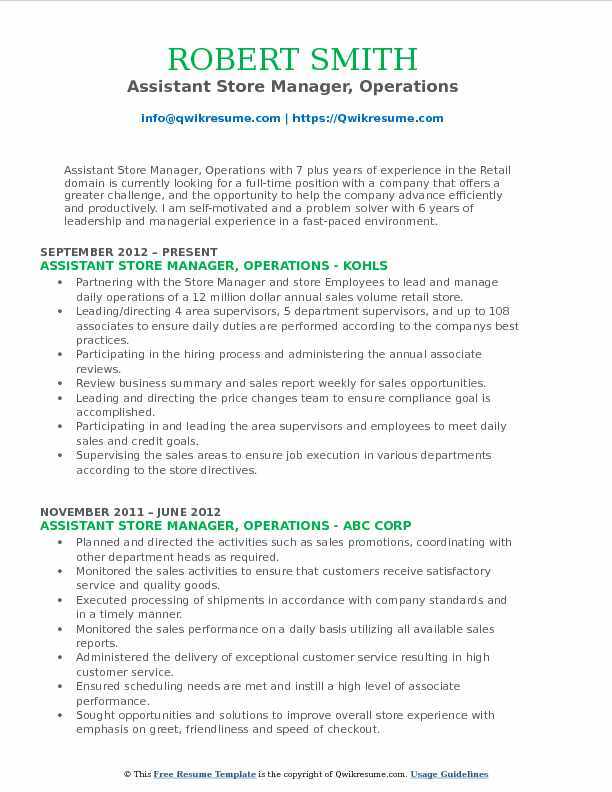 Summary : Assistant Store Manager, Operations equipped with extensive experience in retail management and sales. Employs excellent leadership skills and multi-tasking strengths. 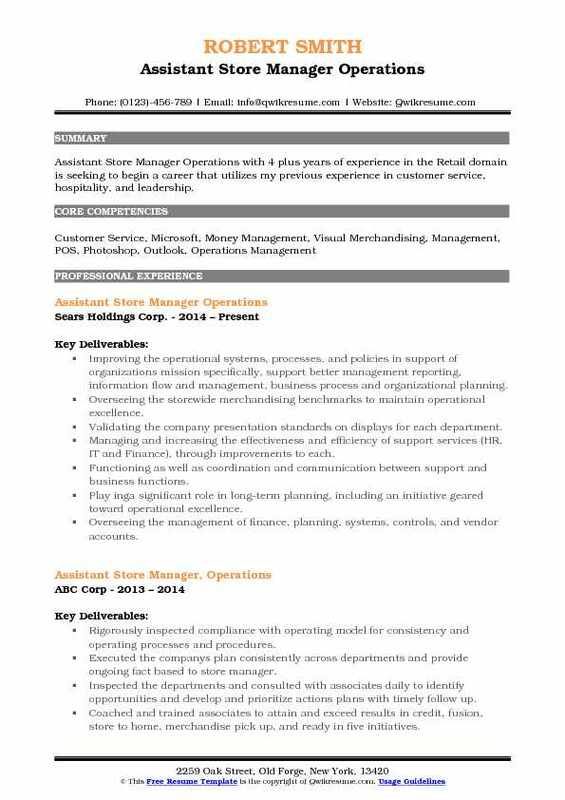 A self-motivated retail leader with over 11 years of active experience. Managing sales volumes of up to $17 million, with associate staffs of 100+. Providing excellent customer service by answering questions and addressing concerns. Reviewing the financial reports to track opportunities and adjust action plans. Utilizing productivity metrics, inventory reports, scheduling program, and payroll budgets. Overseeing all store operations, with a direct focus on the backroom and front end to ensure compliance with all company policies and procedures. Training 15 new managers for stores within the district, transitioning to mentor post-training. Responsible for hiring over 100 new associates and evaluating performance. In the absence of the store manager, successfully stepped into the said role while maintaining operations position. Facilitating the training of over 100 store management teams in a new scheduling program.